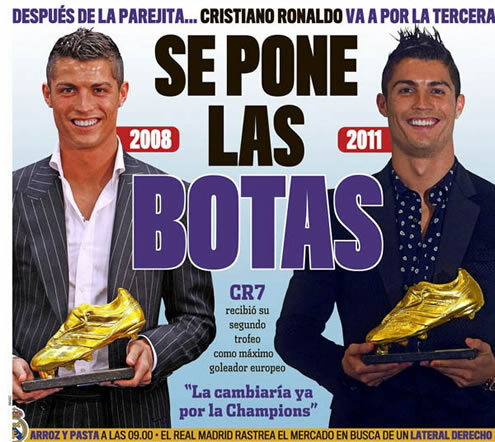 ﻿ Cristiano Ronaldo: "I didn't need votes from anyone to win this award"
05.11.2011 » Cristiano Ronaldo: "I didn't need votes from anyone to win this award"
Cristiano Ronaldo received the European Golden Shoe of 2011, in a ceremony where the Portuguese player had to answer many questions from the media. Among several topics, Ronaldo said that he is truly happy for winning this trophy, because unlike the FIFA Balon d'Or, he didn't depend on subjective votes. During the European Golden Shoe 2011 ceremony and press-conference, Cristiano Ronaldo seated down to answer a few journalists questions. Ronaldo approached his rivalry with Bacelona's Lionel Messi and said that it is a good thing to compete with the best. However, he also left a remark on the difference between the FIFA Balon d'Or (the winner will be decided on the 9th of January, 2012) and the European Golden Shoe. Ronaldo outlined that he didn't need anyone to vote for him to win this award, in a sort of a critic to the Balon d'Or decision model, who's winner will be revealed in the 9th of January, 2012. The ceremony started near 16:00 in Madrid and one of the first figures to share his words was Real Madrid's honorary president, Alfredo Di Stéfano: "Good players can play at any club and Ronaldo has been doing it marvelously in Real Madrid. We are all very happy with him and we hope he can keep with this form for the many years to come. I wish him and his family all the best! ", said one of the biggest legends of Real Madrid. Righter after Di Stéfano finished his intervention, another all-time football legend spoke a few words. Eusébio da Silva Ferreira, still seen by many as the greatest Portuguese football player of all-time, praised his countryman and confessed his admiration for Real Madrid. Eusébio: "Cristiano Ronaldo is 26 years old and he still has many football years ahead of him. My team in Spain is Real Madrid and I'm confident Ronaldo will win more "Balon d'Ors" and Golden Shoes. Let's hope he's lucky enough to achieve more of these honors, as well as maintain the same willing to keep excelling himself. He's a boy who listens to advices", pointed out Eusébio, also known as "Pantera Negra". Cristiano Ronaldo wasn't the only one to receive praises during this ceremony, as Eusébio also had a few words reserved for Alfredo Di Stéfano: "For me, Di Stéfano is the number one in football. Many thanks, Alfredo! ", said the former Portuguese player, before telling a funny incident that occurred when both players faced each other in the past. Eusébio told the room that he cared more about keeping and preserving Di Stéfano's shirt/jersey in the end of a match between the both, than actually holding the European Cup that he had won that day, when playing for S.L. Benfica. It was then time for CR7 to address to the journalists. Cristiano Ronaldo: "This award is for all the Portuguese people. I also want to share it with my teammates, the team staff, the fans and supporters, the president, the club's employees, my family and my girlfriend. They have all been truly important on this journey! ", started by noting Ronaldo, in an honorable statement. CR7 then rose to receive the European Golden Shoe award and take several photos. After a few minutes marked by many cameras flashes, Cristiano Ronaldo returned to his seat and started answering a few questions raised by the journalists. The first one was related to the Portuguese National Team hopes for glory. Ronaldo: "It's been a while since we dream to win an important trophy for Portugal. I'm confident and I believe that Portugal has a great team and therefore, I think we have chances to win something important. But for now, we have to focus on the knock-out round against Bosnia-Herzegovina, in order to be present in the Euro 2012", replied Ronaldo before adding that club-wise, he also has great expectations. Ronaldo: "I want to win in Real Madrid what I have won in Manchester United. I'm really confident on this team and I have a strong belief that we can do it", said the Portuguese player, showing once again, his neverending confidence in winning every competition he disputes. One the questions that popped out from the journalists was related to the possibility of Cristiano Ronaldo switching that award for some other trophy. The Portuguese had already recently said that his priority is to achieve collective trophies, so the answer wasn't very surprising. Cristiano Ronaldo: "I would switch and trade right now this Golden Shoe award ("Golden Boot") for the UEFA Champions League or "La Liga" trophy." Cristiano Ronaldo: "I'm going to be as honest as possible: I don't think about individual honors, but rather in team trophies. If Real Madrid wins, then I also win. I'm not worried about breaking individual goalscoring records, since all I want is that Real Madrid wins. A club such as this, can't stay without winning big trophies for so long. Just as I said before, we're better now, more mature and experienced, with more confidence and we truly believe that step by step, we'll be able to win important things for Real Madrid. Everyone at the club share this same thought and we are very confident that we'll manage to do it." 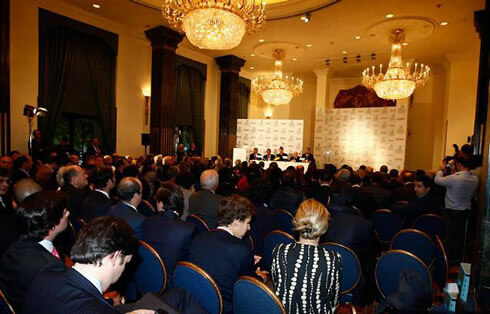 CR7 then spoke out a few words for thanking the presence of his 2 honor guests at this Golden Shoe award ceremony. Cristiano Ronaldo: "It's a true honor to be seated and surrounded by these two football myths and to be able to talk and share some time with them. I won't hide that it would be great to be part of a list that include the names of the best football players of all-time. However, I'm still 26 years old and I keep learning. I'm in a club that allows me to grow up and I still have many years coming up to keep winning things. 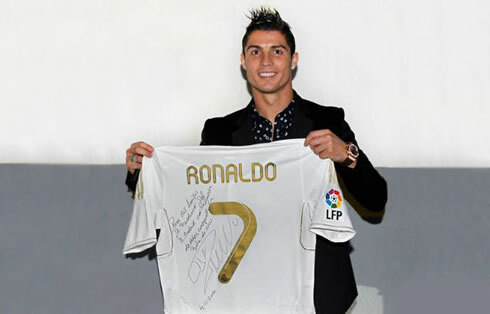 My objective is to always be among the best, of course", emphasized Ronaldo. A topic hard to avoid from the press was the Cristiano Ronaldo vs Messi debate. Cristiano Ronaldo started by dogding the issue. CR7: "I'm not worried at all with that. It means nothing to me. I'm delighted at Madrid and the club fans are also happy for having me here. We just need to win trophies. It's always nice to receive these individual trophies, but the most important ones are the collective ones", stressed out Ronaldo. Cristiano Ronaldo: "It's a lot better to compete with players such as Lionel Messi. We have to compete with the best to really know what our true level is. But there are several other great players in Europe and the big difference is made on how the team performs at a collective level and not individually." A journalist then asked Ronaldo to draw a comparison between Real Madrid and Barcelona, but the Portuguese player preferred to avoid the issue: "In Real Madrid, we prefer not to compare ourselves with other teams. We're following our own path. We're doing well and this is what we have to do, so I don't like comparing teams", replied CR7. In an attempt to extend the comparisons being made, Cristiano Ronaldo was asked to share his opinion on the differences between the FIFA Balon d'Or and the Golden Shoe award. In a sort of a preview to what can happen in January, when FIFA announces the winner for the Best Player of the Year (2011) award, Cristiano Ronaldo indirectly referred to Barcelona's Lionel Messi, the winner of the two last editions of the FIFA Balon d'Or (2009 and 2010). Ronaldo: "The Balon d'Or is the result of people's opinions, since it's based on votes. 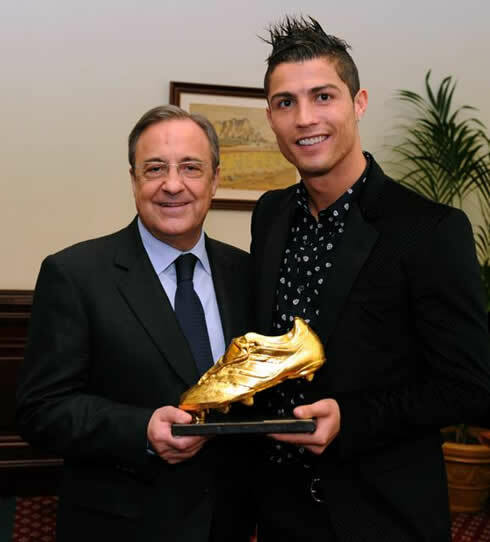 In the other hand, this award (Golden Shoe) doesn't depend on the votes from anyone", fired the Portuguese player. Recently, there have also been a few remarks made on the low importance that Cristiano Ronaldo goals have, since Real Madrid only won 1 trophy last season (Copa del Rey). Ronaldo defended himself: "If even God didn't please everyone, why would I be able to do it? I listen to the critics, but they are personal opinions. It's true that I have scored many goals and we didn't win many trophies, but we are working hard to achieve more success in the future." Regarding a Carlos Queiroz comment this week, on which the former Portuguese National Team coach revealed that he was planning to cast his vote on Messi rather than on Ronaldo for the FIFA Balon d'Or award, CR7 replied ironically: "Great choice, really good!". When analysing Real Madrid team, Cristiano Ronaldo once again paid tribute to his teammates. Ronaldo: "There's a good chance that this team is the best I've ever been with. That's my opinion, but we still have to win trophies. When you don't win, you can't be the best. In Manchester United, we won trophies every year and for that reason I think we were the best at that time. Right now, I think Real Madrid has the best squad, buy we have to wait for the end of the season to see if we can win the important titles." 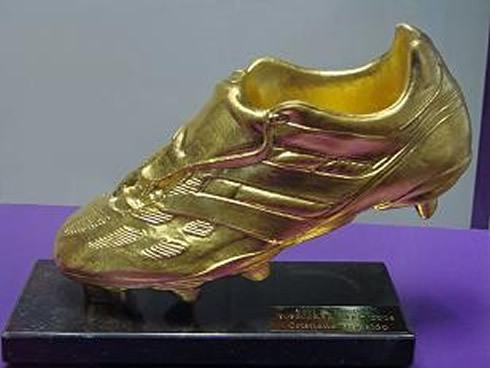 In 2008, Cristiano Ronaldo won his first Golden Shoe award, while playing for Manchester United. The Portuguese player scored 31 goals in the English Premier League in the 2007-2008 season, but he acknowledges a few improvements on his game since then. Ronaldo: "I've been developping my heading game at least. It allows me to give a bigger contribute to the team and become more useful. I like to help. The team has been doing very well so far and it helps me the same way I help them." Real Madrid coach, José Mourinho, also sent his congratulations to Cristiano Ronaldo for winning this award and shared his critical point of view on the way FIFA keeps awarding the Balon d'Or trophy for the Best Player of the World: "The Golden Shoe award is a trophy that doesn't depend on voting polls, it has an objective criteria. I want to congratulate Cristiano Ronaldo for the goalscoring stats he achieved last season, not only in the Spanish League, but also in the UEFA Champions League, which is the same as saying, the two most important competitions", noted the Portuguese coach. Ronaldo also confessed his wish of counting with José Mourinho in Real Madrid for a long-time, even if that necessarily means that the Portuguese National Team wouldn't be coached by Mourinho in a near future. CR7: "Mou is perfect here at Real Madrid. I hope he can stay with us in the years to come." Cristiano Ronaldo has shown in several occasions that he is very grateful for those who helped him both in the past and the present. One of those persons is Sir Alex Ferguson, who completes 25 years as Manchester United coach this Sunday. The Portuguese player didn't forget the Scottish coach. 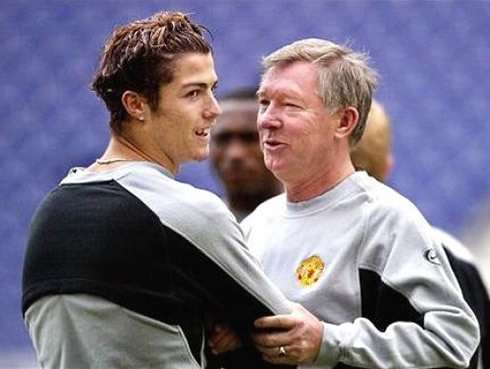 Ronaldo: "I met Sir Alex Ferguson when I was only 18 years old and in that time, I was an unexperienced young boy. He has been crucial in the way I've grown up and matured, as well as in the way I've developped as a man", noted CR7, before adding: "I look at him as a father and that's a good example of how important Sir Alex Ferguson is in my life. I'm eternally grateful to him, since he's a reference in my life, who I will never forget." 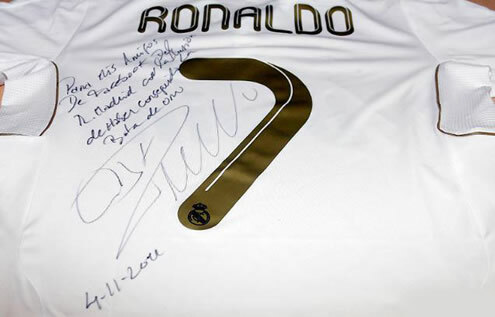 Cristiano Ronaldo had another good gesture after the event and it was revealed by his teammate, Sergio Ramos. The Spanish defender recently posted a photo on his personal Twitter account, of himself holding a crystal shoe (boot). He then explained it and said that Cristiano Ronaldo offered that same crystal shoe trophy to all his Real Madrid teammates! You can take a look at that crystal boot photo, in the pictures posted on the bottom of this news article. Before closing this Golden Shoe press-conference talk, Cristiano Ronaldo left an advice to all the kids around the World: "Listening is a very wise thing that anyone can do, but after doing it, we have to decide what to do next. If you want, you follow the advice, if not, you ignore it. What I can recommend to the kids is that if they have a dream, then follow it no matter what, because we always get our chance throughout our life. Just keep having faith! ", recommended the Portuguese player. Real Madrid next game is against Osasuna this Sunday, for La Liga. You can watch Juventus live stream, Real Madrid vs Osasuna, in our Football Live Streams section, but please note that the match will start at a very unusual hour (11:00 GMT+0). The countdown clock timer, displaying the time left for the next Ronaldo game, is shown on the top right corner of all pages. Besides that game, you can also watch AC Milan vs Catania and Athletic Bilbao vs Barcelona this Sunday. All streamings are provided from our "Live" section.